Hardware Device Problem 31 Hardware issues found on network switch or Access Point. ICTO replaced the malfunction hardware to resolve the problem. *IP Address Blocking 18 The Internet IP Address of users were blocked or restricted by China Internet Service Provider (ISP). ICTO reported cases to Macao ISP (CTM) and renew the IP. Internet Service Problem 12 Internet bandwidth was restricted by Macao ISP (CTM) between 14:00 – 18:15 on 27 Sep 2018. ICTO reported to ISP and the Internet service was resumed. Signal Problem 11 The Wi-Fi signals were weak in reported area, ICTO installed additional AP to solve the signal problem. Slow Speed 8 There are various factors constitute to the problem (including but not limit to: Congestion on Local Area Network, Congestion on Internet bandwidth, Congestion on the network path between UM, ISP and the remote website/servers and heavy loading on remote servers) and user did not report when the problems were encountered, the problems could not be re-enactment nor identified from the reported cases, we will keep monitoring on the performance of Internet. *Compatibility Problem of User Device when Using 5GHz Wi-Fi 7 The compatibility problem of those devices which purchased outside Macao had been fixed by removed some unavailable channels from the air. Software Setting Problem 7 Users set a wrong IP/DNS or proxy setting in their device, it will cause internet connectivity problem. Account Problem 5 User account is locked due to account compromise or failure password attempt, ICTO has taken action after user reported. Asking about the Light of AP 4 ICTO switched off the LED light of the AP after user reported (only available for dormitory). Over Connection Session 2 Some programs (e.g. Bit Torrent or P2P download) create too many connection sessions, which will trigger the protection mechanism of ICTO to protect the flooding of the network and blocked the device from abuse of the Internet resource. After the student uninstalled the related programs, the problem was solved. Packet in Unknown Pool 1 The traffic of QQ was treated as unknown traffic, and was limited in speed and bandwidth. User will experience disconnection during use. The problem is fixed. As there are many different factors that can cause the poor network performance, if you encounter wireless problem, please contact ICTO Help Desk for further investigation and solve the problem. In the following paragraphs, we would like to explain further about the situation regarding the restriction of access to China websites and the compatibility issue of user device when using 5GHz frequency band. The Internet IP Address of users were blocked or restricted to China websites. User will experience slow respond or even no access to those websites. User can access to internet (e.g. Google, YouTube…), but cannot access to China website/Apps (e.g. WeChat, Weibo, Baidu…). User can try to use different SSIDs (UM_WLAN_PORTAL, UM_PUBLIC_WiFi) to change different local IP address. After changed the IP, test the same website/Apps. Please send the local IP, data/time and website/App that has access problem to icto.helpdesk@um.edu.mo for checking. 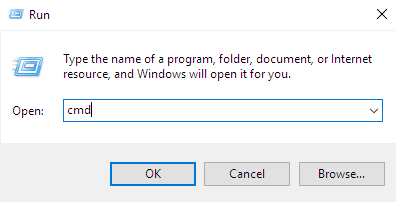 Click “Windows key +R”, type “cmd” in the search bar and press OK.
A Command Prompt will be launched. Type “ipconfig” and press enter. Capture the information as the picture. Click the Spotlight icon , type “Terminal” and press enter. The Terminal will open. Type “ifconfig | grep inet” and press enter. ICTO will report cases to Macao ISP (CTM) to renew the Internet IP in order to solve the problem. In addition, ICTO has increased the Internet IP pool to lower the possibility of this situation from happening. ICTO is providing 5GHz wireless network since 2014. On UM Campus, our wireless access points support the standard of IEEE 802.11b/g/a/n/ac for frequency bands 2.4 GHz and 5GHz to provide the speed up to 450Mbps for wireless connections. In the wireless LAN environment, 2.4GHz mainly works in 2.4GHz wavelength providing three non-overlapping channels known as 1, 6 and 11, while 5GHz works mainly in 5GHz wavelength in which channels are opened differently in different countries. There are different factors that interfere with the user experience. Users may experience the difference when using 2.4GHz and 5GHz, as higher frequency directly affects the wave’s speed. Thus, you may experience better data rates transition when using 5GHz than 2.4GHz due to the wavelength difference. In addition, many WiFi-enabled and other household devices use 2.4 GHz band, including wireless keyboards, cordless phones, microwaves and garage door openers. When multiple devices attempt to use the same radio space, overcrowding occurs. The 5 GHz band tends to have less overcrowding than the 2.4GHz band because fewer devices use it. On the other hand, 5GHz can only provide shorter range coverage than 2.4GHz by its physical limitation. The reason is caused by its high frequency which cannot penetrate the walls and obstructions on its way compared to 2.4GHz. Last but not least, the eventual speed user experienced will also depend on how many users sharing one access point, the internet bandwidth behind the connections and the performance of the visiting site, etc. User may experience network disconnection and no Wi-Fi signal when using those channels on Apple devices or devices of certain brands. In 2015, some Apple devices could not use 5GHz wireless network in some areas of Campus. The students (who were using Apple devices) reported that the wireless network was slow in some areas on UM Campus. ICTO investigated the cases and found that those devices could not use some Channels on Campus. It was found that the Channels list of Apple devices in use in Macao were outdated. In 2018, we found the similar case on the mobile device of some Chinese brands. Devices could only use the wireless channels opened in China. ICTO sent the feedback to Apple support. The problem was solved in the update patch of 2017. ICTO measured the amount of usage of those branded devices and evaluated the influences. In January 2019, ICTO configured the supporting channel numbers to fix the problem in residential college areas.